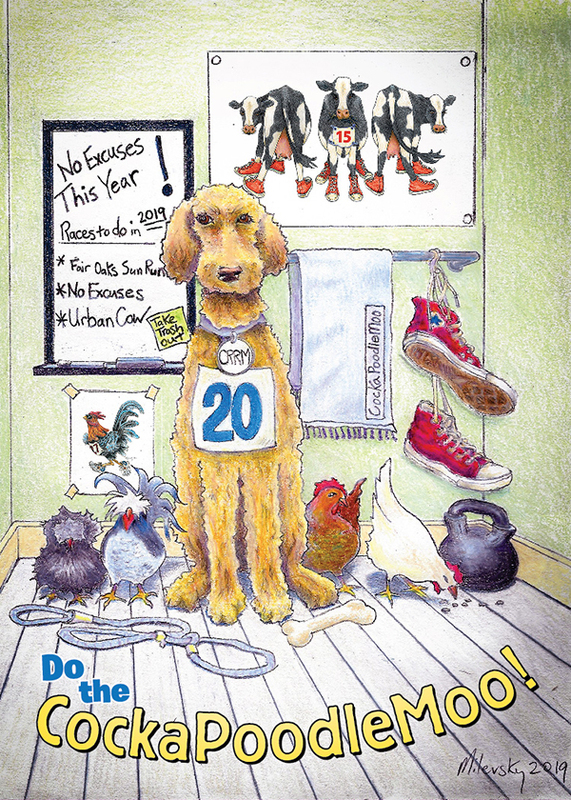 The CockaPoodleMoo is a “THREE-LEGGED” RACE SERIES, produced by Capital Road Race Management, full of fun, challenge, humor, animals and BLING! How do you do the CockaPoodleMoo? Fair Oaks Sun Run, a sun-splashed hill-fest packed with precocious plumed peckers on the first Sunday in May. No Excuses 5K, a pooch-positive and patriotic party in the park on Memorial Day. Urban Cow Half Marathon, a fabulous fall foot tour of Sacramento that rustles and hustles with the most divine bovine in the area, always the first Sunday of October. Register for all three events (any distance except Kids’ Fun Runs). After you cross the finish line at Urban Cow, you will be rewarded with a CockaPoodleMoo series menagerie medal, a reward with such animal magnetism you won't be able to resist! Important Notes: This series registration page allows you to register for all three races at the same time, however you may register for each race individually and still be eligible for the series. Kids' Fun Runs do not count as participation in the CockaPoodleMoo.